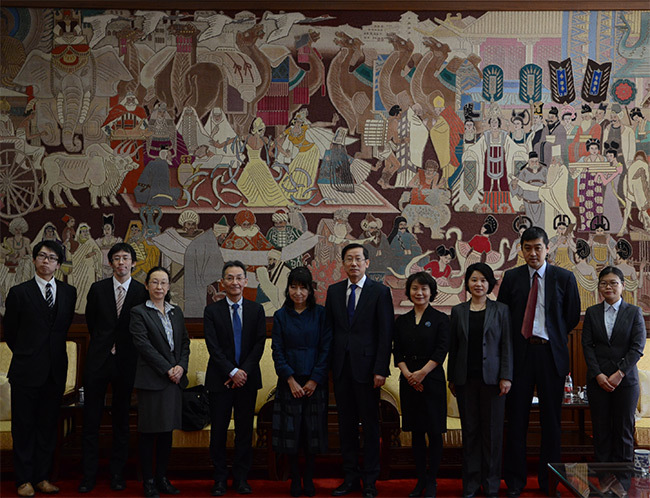 From 26 November to 2 December, a 5-person delegation led by Kazuko Sakata, Deputy Director General of the National Diet Library (NDL), visited the National Library of China (NLC) for the 37th business exchange between the two National Libraries. On 27 November, Rao Quan, Director of the NLC, and Chen Ying, Deputy Director of the NLC, met with the delegation led by Kazuko Sakata. Rao Quan reviewed the history of business exchange between the two National Libraries, acknowledged the fruitful outcomes achieved by long-term exchanges and cooperation; he hoped that both the NLC and the NDL could continually carry out business exchanges in various forms, to promote mutual development of Chinese and Japanese librarianship. Kazuko Sakata said that the two National Libraries had a good tradition of business exchange; the NDL would continue to share experiences of business development with the NLC through exchange. She also conveyed Director General Sawako Hanyu’s congratulation on Rao Quan’s assumption of the Director of the NLC. At the two business exchange meetings held on 27 and 28 November, delegates from the NLC and the NDL had in-depth discussion on latest development of their libraries, legislative services, children’s library and other library business issues. Chen Ying and Wang Dongbo, Deputy Directors of the NLC, attended the two meetings. Chen Ying made the Chinese keynote report named To Perform New Functions, to Meet New Challenges and to Break New Ground, and Kazuko Sakata made the Japanese keynote report named The First Priority of the NDL: To Serve the National Diet of Japan. During their visit in China, Li Honglin, Deputy Director of the NLC, also met and exchanged views with the delegation from the NDL. In addition, the delegation also visited cultural institutions such as National Science Library in Chinese Academy of Sciences, Chinese Academy of Social Sciences Library, Capital Library of China, Shanghai Library and Shanghai Children’s Library.